Hi. My name is Janet. And I am a hoarder. I like to buy things on sale. I like to buy things for dishes I plan on making. As such, I have purchased seemingly obscure ingredients and spices for ethnic dishes. I try to cook with fresh ingredients, so my fridge is usually packed with food and my freezer is filled to the brim. My excuse is that I have a condo-sized fridge, which I feel is not much bigger than a beer fridge. 😛 One year ago, this is what my fridge looked like, when I was profiled on blogto.com. Since I have a tiny kitchen in a tiny apartment with limited storage, I have kitchen appliances and food stashed in each room. 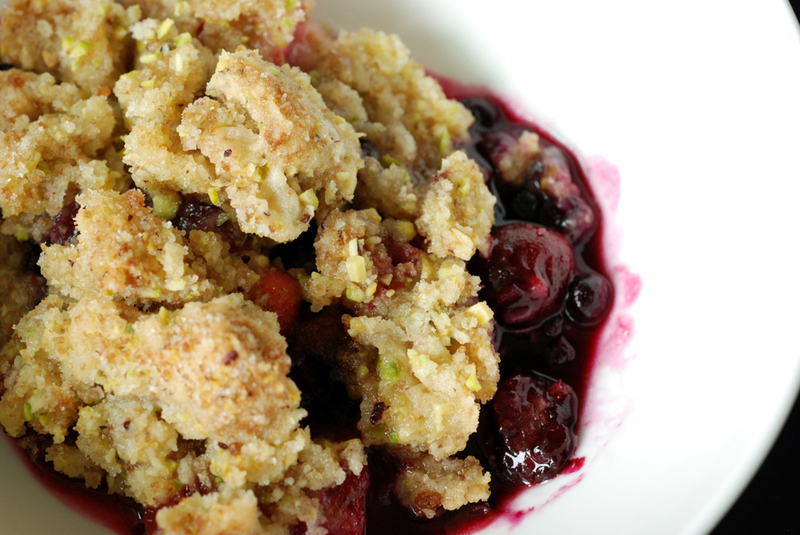 I figured I would also try to help clear some room from my freezer when I saw the blueberry rhubarb crisp with a pistachio crust from Gourmet (June 1999). I knew I had frozen blueberries, so I was off to the races. But then when I measured them out, I was a cup short. Oh no! What to do?! 🙂 Luckily, fruit abounds in my freezer, so I had to decide between mango and cranberries. In the end, I used cranberries to add to the blueberry/rhubarb mixture. And you know what? It was perfect. Sometimes the wacky impromptu substitutions work well! This seemingly odd combination of tart, soft baked rhubarb with not-so-sweet blueberries and even more tart cranberries was wonderful. The pistachio crisp topping had just the right amount of sweetness for the base and since I squished the topping together, there were nice hearty globs of topping for the fruit filling. The only thing I would do differently next time is increase the fruit filling. This was delicious slightly cooled from the oven as is, but the leftovers were perfect with vanilla yogurt the next day. The warm crisp with lightly melted vanilla ice cream is an equally decadent treat. Dessert? Breakfast? Sometimes I can’t decide. This is my submission to Magazine Mondays and Gourmet Unbound. 1. Preheat oven to 375°F and butter a 9×9 ” 2-quart shallow baking dish. 2. In a bowl stir together sugar and flour. Trim rhubarb and cut enough of stalks into 1/2-inch pieces to measure 2 cups. Add rhubarb, blueberries and cranberries to sugar mixture, tossing well, and spread mixture in baking dish. 3. In a bowl whisk together flour and sugars. Cut butter into 1/2-inch cubes and with your fingers or a pastry blender blend into flour mixture until mixture resembles coarse meal. Add pistachios and toss well. 4. 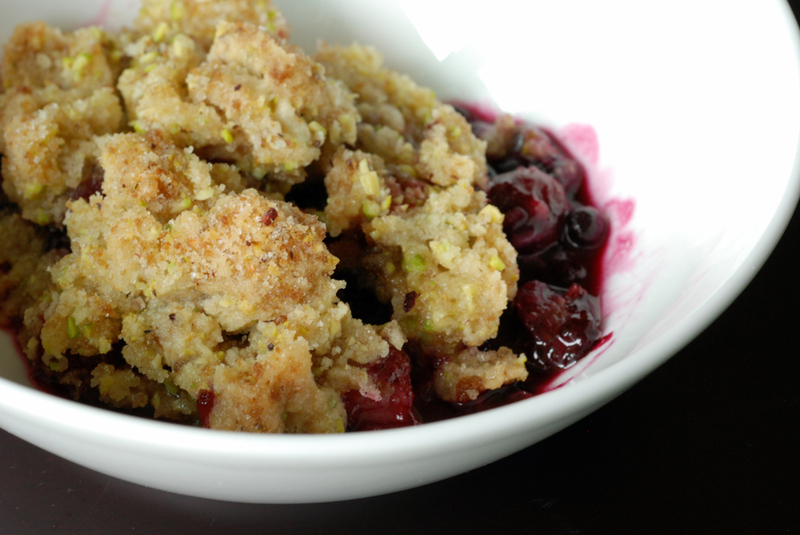 Squeeze a handful of topping together and coarsely crumble in chunks over filling. Squeeze and evenly crumble remaining topping over filling in same manner. Bake crisp in upper third of oven until filling is bubbling and topping is crisp and golden, about 50 minutes. 5. Serve crisp warm or at room temperature, alone or with vanilla ice cream or yogurt. Oy my fridge is a disaster at the moment. Don’t even ask about my freezer. I DO have tons of frozen cranberries though! As in, about five bags. I’m a huge cranberry hoarder. And pesto. I hoard homemade pesto as well. It’s a problem. This crisp looks amazing! I love the pistachio crust on top. Breakfast AND dessert. And maybe dinner as well. Depending how gluttonous I feel (very). I’d be afraid of what I’d find if I looked in the back of my freezer! There is nothing odd about this, Janet! Delicious! YUM!!! The pistachio crust sounds divine. I can’t wait to try this! Blueberries, rhubarb, cranberry and pistachio would be an excellent flavour combination for a crisp!